What is Orthica Brain Support? What is this dietary supplement used for? 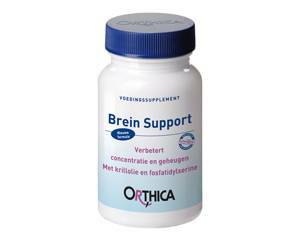 How to use Brain Support by Orthica? Orthica Brain Support is a dietary supplement based on krill oil, an ingredient rich in omega-3 fatty acids. Brain Support has a beneficial effect on brain functions and is particularly well suited for school-aged children (aged eight and up), and elderly people. This is because omega-3 fatty acids play a key role in the functioning of the brain. The dietary supplements by Orthica are known for their high quality and contain no artificial flavourings, colourings or preservatives. Krill oil is packed with two key unsaturated fatty acids, EPA and DHA (also referred to as omega-3 fats), which help the brain to function optimally. They insulate nerve cells in the brain, allowing these nerve cells to better communicate with one another. Unsaturated fatty acids are mainly found in fatty fish. Most people don’t eat enough fatty fish to get their share of omega-3 fats. Orthica Brain Support takes care of that. This dietary supplement is particularly well suited for school-aged children because it supports their cognitive development. Omega-3 fats also deliver significant health benefits for people over 65 who want to keep their brain functioning at optimum level. The omega-3 fatty acids in Brain Support are bound to phospholipids and therefore easily digestible. Brain Support capsules also contain Vitamin D and a natural mix of Vitamin E for better resistance to illness. Brain Support can be combined with multivitamin supplements. The recommended dose is one to two softgels per day, preferably with meals or directly after. Read the label instructions on the package before use. Orthica Brain Support is generally well tolerated. If you do experience side effects, consult a doctor. Orthica Brain Support should not be used in children under eight years of age. Do not use if you are allergic to any of the ingredients (see the package leaflet or package). Do not use if you are pregnant or breastfeeding. Orthica Brain Support is not suitable for vegetarians.